The news was announced this morning, and the internet fan sites are already lit up with outrage. Francis Lawrence will direct “Catching Fire,” the sequel to “The Hunger Games” beginning production later this year. Lawrence has three movies under his belt: 2005’s “Constantine,” 2007’s “I am Legend,” and 2011’s “Water for Elephants.” Producers must feel he has a knack for adapting beloved source materials, as all of those films were based on books (or in the case of “Constantine,” a graphic novel) that are beloved by their respective fan bases. Of course, none of them compare to fans of “The Hunger Games” trilogy. Lawrence has a lot to live up to here. First of all, sequels are always difficult because they have to simultaneously pay respect to and out-do the original. Even for those who were fans of the books, seeing “The Hunger Games” on screen had a newness and vitality that cannot be replicated in a sequel. Further, there is the matter of the schedule. Gary Ross, who directed the first film, reportedly bailed on the sequel because of the tight schedule. Due to star Jennifer Lawrence’s full slate of projects (she also needs to film the sequel to “X-Men: First Class,” which will undoubtedly more prominently feature her character, Mystique), production for “Catching Fire” will begin in September. That is not a lot of time for a new director to plan a film with the biggest budget and expectations he has ever managed. Will Smith in "I am Legend"
In these early scenes, Lawrence achieves such a strange and wonderful tone. We know that Neville’s life is sad and lonely, but Lawrence also taps into the common childhood fantasy of having your run of the world. What child hasn’t wished his parents were gone so he could eat all the candy in the cupboard and watch TV all day? The first half of “I am Legend” made me remember that feeling. Unfortunately, “Catching Fire” and “I am Legend” have little else in common. In particular, “Legend” works best when Neville is the only character on screen (except his dog), and “Catching Fire” will be filled with supporting characters. Still, there is no reason to think that Lawrence is not up to the challenge. 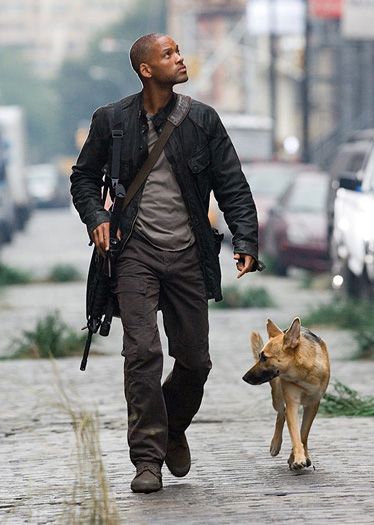 The second half of “I am Legend” failed for one reason only: the zombies. Neville discovers that he is not the only one left in the city; soon, he is being stalked by a group of mutants who were not killed by the virus but turned into zombies. The special effects are just terrible, and from the moment we get our first extended look at the zombie, it is hard to take the movie seriously. “Catching Fire” will certainly have its share of special effects, but it won’t rely on them to the same degree. There is no question Lawrence has a tall task ahead of him. But his work in “I am Legend” shows a real potential to merge serious subject matter with crowd-pleasing thrills. The producers of “Catching Fire” have given him a chance to fully realize that potential on the world’s biggest stage. It’s a big risk for them and for “Hunger Games” fans, but it will be exciting to see how it turns out.